This PDF 1.4 document has been generated by 3B2 Total Publishing System 7.51n/W / Acrobat Distiller 6.0.1 (Windows), and has been sent on pdf-archive.com on 20/07/2017 at 21:44, from IP address 155.37.x.x. 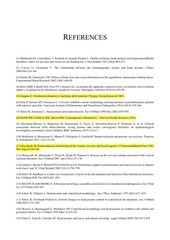 The current document download page has been viewed 83 times. File size: 838 KB (4 pages). of bonded lingual retainers that enables the operator to save considerable chair time. reseated loosely without cementation (Figure 1). Alginate impressions are made using standard trays. Dental Sciences, Nehru Nagar, Belgaum, 590010 Karanataka, India. Accurate casts are poured in stone. the molar bands (Figure 3a,b). retainer are soldered to the molar bands (Figure 4a,b). placed back in the patient’s mouth (Figure 6). bonded tooth on either side (Figure 8). 3. direct trauma to the retainer. remained difficult and has not gained wide acceptance. state. Thus, the setting of adhesive is totally undisturbed. in this report seems to fulfil all these prerequisites. bond the retainer in place. orthodontic retainers. Am J Orthod 1977; 71: 440–48. spacing of anterior teeth. J Clin Orthod 1983; 17: 838–44. Techniques. St Louis: Mosby, 1985: 485–563. of the Science. St Louis: Mosby, 1986: 310–27. 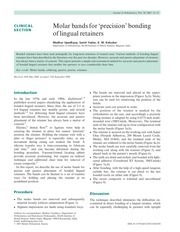 lingual retainers. J Clin Orthod 2001; 35: 608–10. Dentofacial Orthop 1988; 93: 78–82. bonding. J Clin Orthod 1982; 16: 412.
marginal periodontium, Am J Orthod 1988; 93: 143–48. This file has been shared by a user of PDF Archive. Document ID: 00626985.